Click here to opt in to the volunteer pool - opting in will allow you to receive email invitations to apply for new opportunities that match your interest and qualifications. You have a toggle at the top of your Volunteer Profile if you wish to opt out at any time. Complete your volunteer profile. The more information you supply, the easier it is to invite you to apply for future opportunities that align with your interests and qualifications and for staff facilitators to review your applications. You set the privacy settings so you decide what information you want to share with colleagues and what you want to keep private. 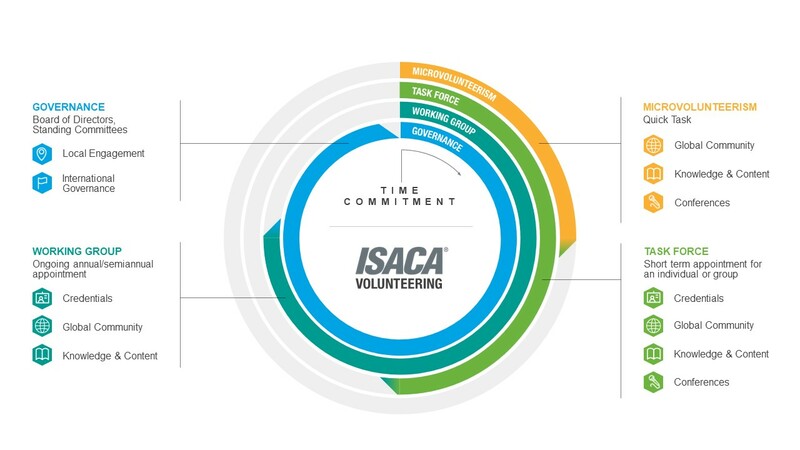 Ensure your volunteer profile indicates that you have agreed to the terms of the ISACA Participation Agreement. If this is not indicated at the top of your volunteer profile, you'll receive an email with a link to complete the form once you apply for a volunteer opportunity. All volunteers must have agreed to the terms prior to being accepted into an opportunity. Check out the opportunities now forming! From working groups to microvolunteerism, the full list of volunteer roles is available through the Volunteer Opportunities List. Apply for the roles that interest you and fit into your busy schedule. ISACA staff facilitators will review the applications and make appointments based on the criteria outlined in the role description. Filter opportunities by time commitment or areas you would like to support to find relevant opportunities that meet you where you are. As part of your volunteer profile, please identify the area(s) in which you are interested in volunteering. This will help ISACA identify opportunities that match your interests and qualifications and invite you to apply. Don't forget to opt into the volunteer pool at the top of your volunteer profile! Global advocacy, public affairs, partner organizations, standards development. Certification or certificate program development, review or edit exam items, evaluate requirements and approve draft exams, create study aid materials. Foster and grow our membership, increase member benefits, support program development for the global profession. Use your subject matter expertise to author or review books, white papers, tech briefs and more. Translate ISACA's knowledge assets, certification exams, and study materials from English. Opportunities to volunteer within your local chapter.